Despite its conventional conclusions, Lelyveld’s biography acquired notoriety following a review in the Wall Street Journal, which claimed that the author depicts Gandhi as a bisexual and a racist during his stay in South Africa, a bald misrepresentation of the book. Lelyveld compares Gandhi’s pronouncements on black South Africans on different occasions and concludes that they remained “contradictory and unsettled.” The second instance of controversy relates to Gandhi’s relationship with an East Prussian Jewish architect, Hermann Kallenbach. The two lived together for about three years in Transvaal and, in one letter, Gandhi pledges “more love, and yet more love… such love as they hope the world has not yet seen.” But Lelyveld never implies that Gandhi and Kallenbach had a homosexual relationship. Rather, he indicates that Gandhi only expected love, devotion, and unquestioning support from Kallenbach. The unfortunate controversy overshadows some crucial points raised in the book. Significantly, at several points, Lelyveld questions the historical construction of the myth about Gandhi. He points to the current South African government’s appropriation of Gandhi into its national history and he presents evidence that Gandhi actually supported South African whites’ suppression of the Zulus in the 1906 Bhambatha Rebellion. Similarly, he questions Gandhi’s saintly status as a champion of India’s lower-caste untouchables. Lelyveld illustrates Gandhi’s limited enthusiasm for a struggle by untouchables in Kerala (South India) to gain entry into temples since he believed that such conflicts could weaken the unity among Hindus in the larger struggle for Indian independence. In his discussion of Gandhi’s successes and failures in India, Lelyveld treads on well- traveled ground and breaks no new turf. But, his discussion of Gandhi’s attitudes towards blacks and the absence of any sustained relationship between Gandhi and black South African leaders raises interesting questions about the role of race in the three-way contest between white settlers, black South Africans, and Indians. The book, therefore, promises to initiate further debate on Gandhi’s views on race as well as on racial relations among non-white populations in the British empire. The Wall Street Journal’s controversial review of Great Soul. 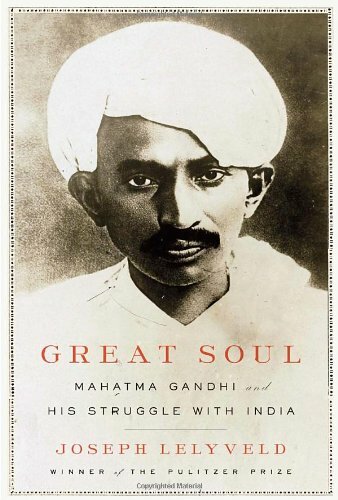 “The Inner Voice: Gandhi’s Real Legacy,” an article that appeared in the May 2 issue of the New Yorker.